Last week was Mr. Lemon’s birthday. Like many years, I came up with an elaborate theme and details for a birthday party. And like every year, Mr. Lemon preferred to do something more low key, which is much more his style and *totally* fine. But, I realized that just because Mr. Lemon doesn’t want a party doesn’t mean I can’t share my ideas with all of you! – For drinks, the number one requirement for any party to be off the hook is, of course, unlimited juice. Go with straight juice boxes for a kitsch factor or an alcoholic jungle juice for the adult crowd. Other drink options include Cloudmir Vodka, martinis, smoothies, or pop pop (from the attic). – AD also gives a lot of inspiration for party food. Chocolate covered Bluth frozen bananas are a must! Other show inspired snacks are cornballs, mini grilled cheese sandwiches (I was made to understand they’d be here…), candy beans, muffin-sized portions of Skip’s Scramble, ice cream sandwiches, and chicken wings…with club sauce. Smaller portions are perfect for a viewing party. – One of the decor ideas I was most excited to execute were blue handprints a la Tobias all around the house. I’m thinking if you got some washable tempura paint it would (hopefully!) come off after the party. And I would definitely create a banner to hang – perhaps with “Family Love Arrested Development” or “Season Accomplished” or “You’re Killing Us, Fox” on it. 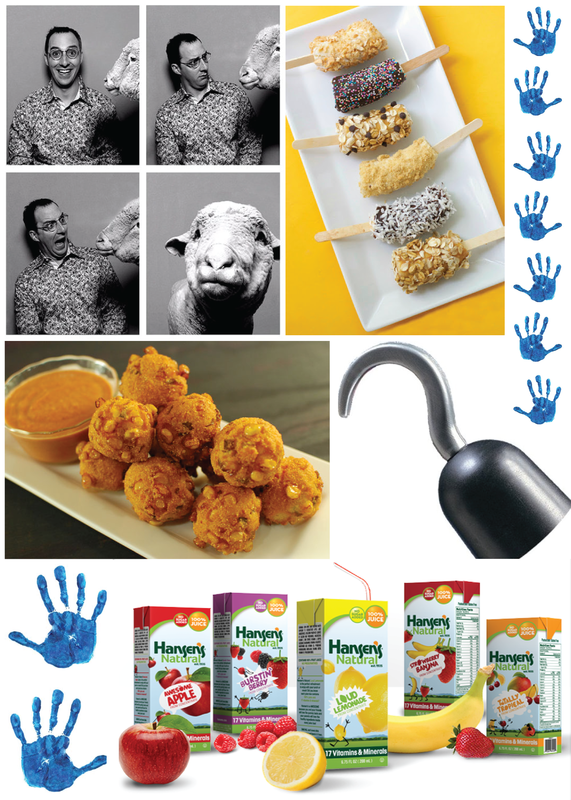 – With such amazing prop ideas, I can’t imagine *not* having a photo booth at an Arrested Development party. Give me a pirate hook, a bow-tied stuffed seal, a giant rock and giant pair of scissors, a dead dove in a bag, and most definitely a sheep profile! Pick props from you favorite episodes and make them into photo booth props. – If you aren’t doing an actual viewing party or just feel like you need some activities, I would recommend something inspired from Army – marksmanship, sand racing, etc – the winner would get put in Hero Squad, naturally. Alternately, a chicken dance-off could get the party going strong! If you haven’t gotten on the bandwagon yet, it’s not too late! Check out Hulu for free episodes. This entry was posted in Party Inspiration, Pinspiration and tagged grown up party. Bookmark the permalink. This is fantastic! Great job, Rebecca!